(Nanowerk News) Scientists at the Mainz University Medical Center and the Max Planck Institute for Polymer Research (MPI-P) have developed a new method to enable miniature drug-filled nanocarriers to dock on to immune cells, which in turn attack tumors. In the future, this may lead to targeted treatment that can largely eliminate damage to healthy tissue. The scientists have recently published their findings in Nature Nanotechnology ("Pre-adsorption of antibodies enables targeting of nanocarriers despite a biomolecular corona"). In modern medicine, patients receiving medication to treat tumors or for pain therapy are often given drugs that disperse throughout the entire body, even though the section of the organ to be treated may be only small and clearly demarcated. One solution would be to administer drugs that target specific cell types. Such nanocarriers are just what scientists are working to develop. These contain, in a manner of speaking, miniature submarines no larger than a thousandth of the diameter of a human hair. 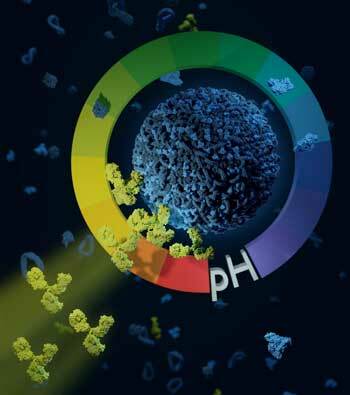 Invisible to the naked eye, these nanocarriers are loaded with a pharmacologically-active agent, allowing them to function as concentrated transport containers. The surface of these nanocarriers or drug capsules is specially coated to enable them, for example, to dock on to tissue interspersed with tumor cells. The coating is usually composed of antibodies that act much like address labels to seek out binding sites on the target cells, such as tumor cells or immune cells that attack tumors.